Our family was away for a little getaway this week. Now we're home, and I found I really needed to prioritize my day. The garden is doing so well, and the pantry is full, there was no need to make a stop at a grocery store on the way home. However, we did go into the drug store to pick up some milk that was on sale. We had seen their sign early in the week on our way out of town. One of my kids remembered as we were passing that store coming home. Yea for kids and their great memories! So we got the two gallons of milk (and a rain check for a third -- they were all sold out of whole milk, and I'd like a gallon for yogurt). We arrived home just before dinner last night. Fortunately, I had left a container of chili in the freezer. That, along with some crackers, made a quick and easy dinner for us. This was wonderful for me, not to have to do a lot of cooking the moment I walked in the door. I was able to take it easy for a bit, and leisurely go through the receipts for the trip and log them into my budget. The trip was indeed affordable! I'll fill you in on the highlights in the next day or two. Before going to sleep last night, I made out my list of priorities for the next day. If my family was to have clean clothing, then laundry should be high on the list. I had seen a lot of green beans maturing on the plants, before we left, plus the dill was about to bloom, so I knew making pickles would also be a priority today. Someone, who shall remain nameless, took a half gallon of whole milk out of the freezer, the morning that we left, and put it into the refrigerator for the duration of our trip. This was the last half gallon of whole milk. I'd been saving it for yogurt. As it was now thawed, this meant that making yogurt would also be necessary for the day. If we were going to have fresh yogurt for Friday breakfast, then I also wanted to make a batch of granola. Plus, I wanted to get a start on painting the garden bench. Busy, busy day! But, as the saying goes, gotta make hay while the sun shines! So, how'd I do? I got to everything, with the help of my daughters! And as you may want to try dill green pickles yourself, here's the recipe. How do you make pickles when you have no cucumbers? Well, for us, we make Dill Green Bean Pickles. These are a treat that grace our Thanksgiving and Christmas table every year. 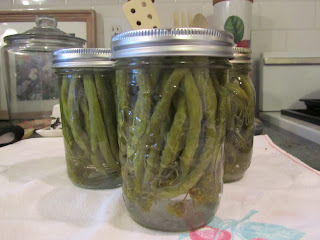 They're easy to make and almost free for us, as we grow green beans and dill in our garden. Wash and sterilize 3 pint jars, lids and rings. Wash green beans. Leave whole, but trim, from stem end, to fit into jars. Wash sprays of dill. 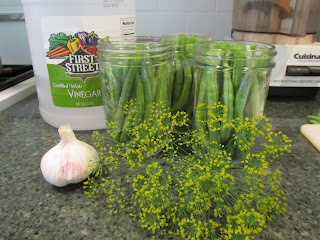 When jars are sterile, pack dill spray, then beans into jars. Add water, vinegar, salt and garlic to stainless, or other non-reactive, saucepan. Bring to a boil. Reduce heat. Simmer for 5 minutes. Strain out garlic cloves, and pour hot liquid over beans. Seal according to manufacturer instruction. Process for 15 minutes in a water bath. Allow pickles to stand, unopened for 2 months. I keep all my unopened pickles, relishes, salsa, jams and jellies in a spare fridge. Call me cautious. I made 3 pints today, and hope to make another 3 pints in a couple more weeks. That will be it for homemade dill pickles for our house, unless the cucumbers in my garden decide to do something. I take what I can get around these parts. With the leftover brine, I simmer it until it is reduced in volume, then use as seasoned vinegar, (blended with plain vinegar in a 50/50 mix, to minimize some of the saltiness) in oil and vinegar salad dressing. And now, I get to go clean the kitchen from all our messes, and make a quick dinner! I'm exhausted. Someone pour me a glass of iced tea! You have been so productive, Lili! What a great and busy day for you. 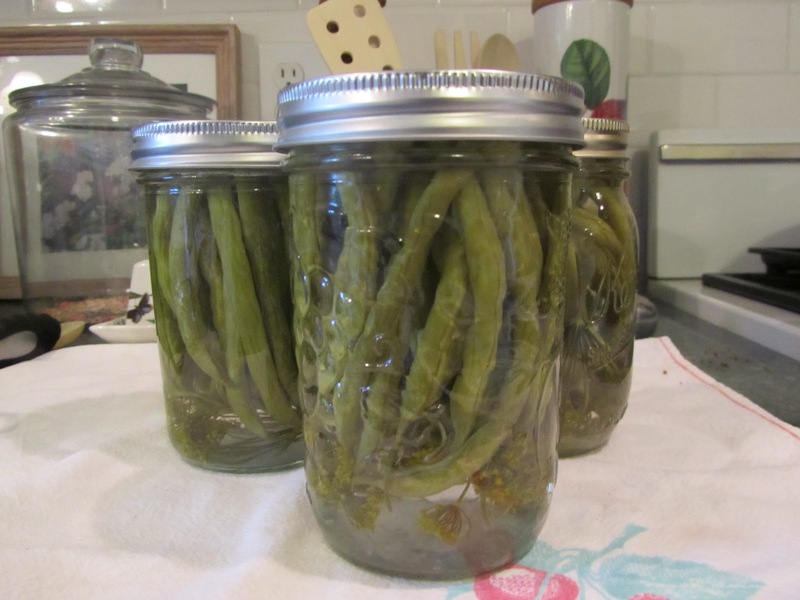 Your dilly green beans look so pretty in their jars. I know you will enjoy them with your holiday meals. I had to stop for milk today too, but didn't buy any. They were out of the store brand and I didn't wan to pay $5.00 fro a gallon of name brand, so I will check back later and see if they are restocked. I don't know if it's this way for you, as well, but when I first get home from a trip, I have so many things I want to do and get done. I set out a lot for myself yesterday and ran myself ragged. Today, not quite so much, but still a full day. August is quickly zooming my and I have a lot to do in good weather. $5 a gallon for milk sounds ridiculous. I lose track of regular prices, always shopping just the deals. I am shocked when I hear what things cost full-price. It would be interesting to just see what I'd spend if I paid no attention to price at all. Welcome home! I've never had dill green beans. Sounds good. I have learned the benefit of having a couple of meals in the freezer that you can just thaw and serve when you return from a trip! There's usually so much to do upon returning that you need to cut corners. Hope you are getting caught up. Looking forward to hearing about your trip. I wish I could say that I planned the frozen chili. but in reality, we found ourselves on the ferry coming home and wondering, "what can we make for dinner?" And that's when I remembered the container of chili. For longer trips I will usually have some sort of plan for dinner the day we come home. Even if the plan is just pancakes or eggs, it's better than feeling like cooking would be too overwhelming, so we go out. Now, to finish off the summer in grand style (my kids just have 3 1/2 weeks left, and want to make the most of everything). Will definatly have to try those dill green beans, my family would love those! I also like to make granola anytime I make yogurt! :) good stuff! We had ripe blueberries this morning, too. So it was yogurt, granola and berries for breakfast. It was so good! 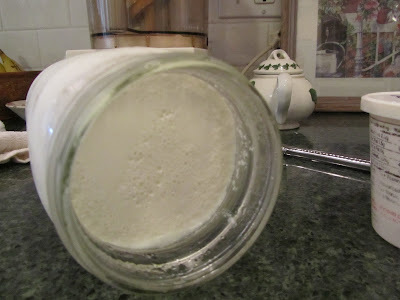 Do you ever make yogurt cheese? I'm draining some yogurt right now, hoping to have something of cream cheese consistency tomorrow. We bought a small packet of smoked salmon while on vacation. I want to make the most of it by making a salmon spread, with mock cream cheese, chives and the smoked salmon. I'm hoping it turns out well. YUM! No I have not done yogurt cheese, I should I have been saying for years I want to make cheese but either chicken out or just always seem to find other things to do LOL. I don't know what stops me really, I need to just do it! the salmon idea sounds wonderful! Let us know how the salmon spread idea works. I have some smoked salmon too & if I know that a yogurt cheese spread works then I'll go to the extra step of making cheese from my next batch of yogurt. Will do! I've had the yogurt in the fridge, draining, for almost 24 hours now. I think I've read that it can take up to 2 days to reach the point of cream cheese consistency. I'll just keep watching and waiting. Now I'll have to dig up a recipe for the spread. My parents used to make a smoked salmon spread, and I think it was just chives, cream cheese and smoked salmon. I'm guessing the yogurt cheese will need salt mixed in, to replicate the cream cheese flavor. I'll let you know how it goes. I noticed you used the phrase, "Make hay while the sun shines." That was a common phrase around where I grew up because most people lived on small farms and had to get their hay put up in good weather. I use it all of the time, but it's not used as much around where I live now even though there are several farms around. Anyway, it's one of my favorite sayings. I say it from time to time, especially in summer, with all I want to get done. 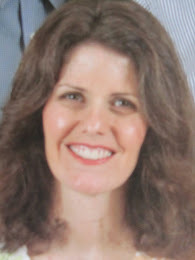 I think I got it from one of the Little House on the Prairie books. I was (and still am) a huge Little House fan. I grew up in sunny so. California, no where near a farm. And I think I was always enchanted by stories of rural life. I totally get "make hay while the sun shines". If you try to cut and stack hay in wet weather, you get musty, moldy stuff. Here in Seattle, so many outdoor projects are ruined by rain. So we take full advantage of every sunny day we get. It's our version of making hay. I love word and phrase origins.